I think that nearly every landscape photographer struggles when they visit a location for the first time. The first instinct is to grab the widest lens that you have and try to capture it all. More often than not the resulting images are busy, confusing and uninteresting. During the Gary Hart workshop that just concluded, a number of folks commented that they had struggled with one location that we visited. It was a morning shoot along the bank of the Merced River. It’s also really the only place that you can get an end-to-end view of El Capitan and the Three Brothers. While I’d been to this particular location many times, I’d never really captured an image that I felt did it justice. After the group spread out and began searching for their compositions I tried to break the scene down to find it’s essence. Really, this hugely vast scene came down to just a few things: the Merced River, the golden first light on[wikipop] El Capitan[/wikipop], the chill in the air and the color of the fall leaves. The next step was to find a composition that embodied those components. After a short walk I came upon this vignette. It’s not the grand vista that one first imagines from this spot but, at least to me, it more accurately captures the “soul” of the location. I purposely left the technical details of my last couple of posts because I felt them to be conflicting with the message of the post but I know that people like to see them. This simple scene contains a challenge that is worth commenting on. Reflections can be difficult. The tendency is to focus on the reflection which often results in a loss of sharpness in portions of the frame. The distance to the object not the reflection, determines the focus. In this case, El Capitan was at infinity not the 2 foot distance to the reflection. To get the leaves and grass sharp and have reasonable sharpness in the reflection I set my aperture to f/11. I was using my Canon 24-70 at 55mm and was as low as my tripod would go. I tried several exposures but the blurring of the water seemed distracting so I brought the ISO up to 400, giving me a shutter speed of 1/5 of a second. I felt like it was just enough water motion to give it texture without being a distraction. 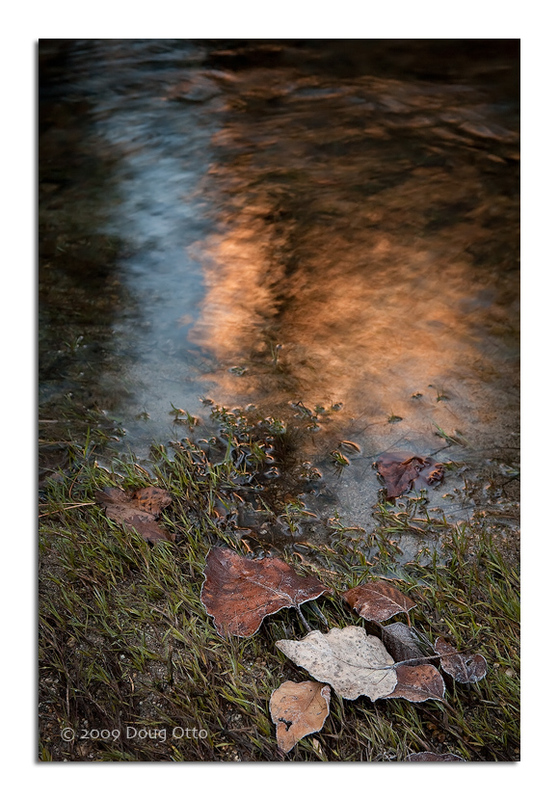 This entry was posted in Photography and tagged Canon 24-70 f/2.8L, doug otto, el capitan, fall color, frost, leaves, Merced River, photo workshop, reflection, yosemite national park. Bookmark the permalink. ← The importance of having your camera.